We’re back! No time to talk about the trip just yet, but as a follow-up to the last post, just wanted to say that our bikes are OKAY. 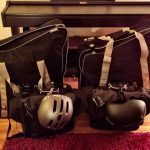 When we arrived at the airport two weeks ago, the WestJet luggage people knew our bags contained bikes (we never asked what the tip-off was – could have been that they know the Brompton name which is written on the bags, or the fact that our helmets were hanging from our carry-ons). So, even though our B-Bags are not oversized and both were under the weight limit (42lbs each; max limit is 50lbs), the WestJet employee told us to bring them to the Oversized/Fragile bag check-in. And they didn’t charge us anything extra. If your bicycle is in addition to your first checked bag, the second, third or fourth bag fee will be charged. Bicycles that exceed the accepted size or weight dimensions will be charged the oversize bag fee and/or the overweight bag fee. So, because our bags were not overweight or oversize, and we had no other checked luggage, we did not have to pay extra. I realize this is not the case at other airlines, which charge simply because the item is a bike. So thanks, WestJet! We appreciate it. 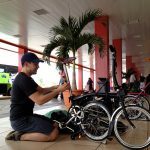 Best of all, our bikes arrived at the Varadero airport undamaged. Note: The Varadero airport is tiny and though in Toronto we checked our bags in Fragile/Oversized, they came out on the regular conveyer belt just like the other luggage. On the flight home, the WestJet employee again knew they were bikes and put a fragile sticker on them, but there was no separate check-in for Fragile items. However, when we arrived in Toronto, our bikes didn’t come out on the regular luggage conveyer belt, but in the special Fragile/Oversize area. Note: For the flight home, we no longer had our fortifying cardboard lining the B-Bag… but the bikes were okay. No damage. So the Bromptons survived their first flight!